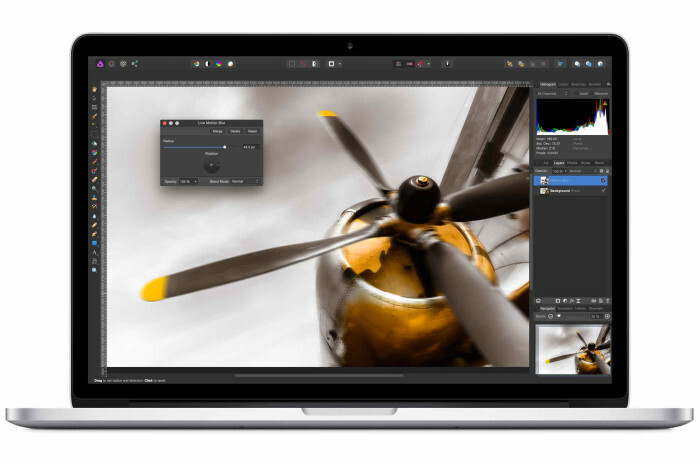 News: Affinity, the Mac and Windows mind-blowing alternative to Photoshop subscriptions! I am happy to bring to readers attention the latest offering from Serif, the Nottingham, U.K., endeavor, from Robin Hood's neighborhood, a feature rich and easy to use photo editing software, worthy of your looking at seriously to cover all of your editing needs if you currently use Photoshop and chafe at the monthly subscription charge. Kudos to Robert Watcher for recognizing the speed demon qualities of this mature software. Affinity Photo, the professional image editing app, gets tons of powerful new features in its next update. Serif Managing Director Ashley Hewson “This will be the fifth major update we’ve pushed out since the launch of Affinity Photo – all free of charge to people who’ve bought the app. I was excited to learn that the public beta of Affinity Designer for Windows was available. I downloaded it, set a Windows restore point in case something went badly awry, and began the installation. The installer advised me that it would be good to have a Windows "Aero" series theme installed, as otherwise there might be rendering shortcomings and performance problems. I do not use an "Aero" series theme or any derivative of same, and had no interest in changing my preference in that regard, so I just clicked on "Continue". The Installation proceeded and completed. I went to start Affinity Designer. I received an error notice saying that I did not have a Windows "Aero" theme in effect, and that was the end. The program would not run. I uninstalled Affinity Designer Public Beta. I was then advised that the live protection feature of my Norton protective system had been turned off. I attempted to reinstate it, and was advised that the process could not complete. I restarted Windows, and the Norton "tray" icon advised that the Norton system was happy. It was a very good experience in that it wasted less than 45 minutes of my time overall, and no adverse side effects have yet turned up. A lot of folks here simply use Adobe Lightroom as their main photography ledger and editing system. I split my efforts between Photoshop and Capture One, but bristle at the extra costs. What's so great about affinity is that it is lightweight in resource needs, works equally well in Mac and Windows worlds and can do some pretty nifty things like focus stacking, in its latest version to be available shortly. Let us know who is downloading which version and any experiences. I'd love folk to start testing this out, as Robert Watcher did months ago! Bristle, indeed, Ash. Even a pensioner like I can afford $10/month. That leaves me with $5 for my other expenses. There is usually something over the fence, or at the end of the rainbow, or whatever metaphor is current, to do 'better' than the last, but, alas, I still can't get my shite photos to look good and the good ones usually come out that way with the minimum of adjustments. I downloaded the beta version to have a look. The students will ask questions of me. They are on to me if I make up an answer, which I often do. The program comes up pretty enough on the face of it. Everything seems accessible and easy to use. A few new tricks that I'm not likely to use unless I want to impress someone. My pictures still look the same. Here. its about $120 up front, depending on the value of the $AU. That's consistent with PS for a year. If I buy it and die next week, I've lost the lot. At least with PS I have left strict orders for Christine to cancel all my subscription before she buries me or whatever she decides to do with the body. I don't ask. I've grown up. digitally, with PS. I'm too old to change my ways. Others will be motivated by promises and humbug. Sad that you have a horrible exchange rate in Darwin. US$40 should be AUS$53! So it appears that they triple the price through the Apple App Store? Is that it? Since economics, (and the pending visit of that hooded man with the scythe and gnarled dry finger coldly beckoning you to step off the tour bus), consider that as Affonity is a speed demon, you will get more work done and even frighten the bugger away completely! Taxes, my friend, and we seem only to purchase through Europe at 77EU. Not available from the US. World economy. Who will ever understand it? Less work is the aim. The less I do the less people have to complain about. I will contact Serif about this price differential. Flummoxes me! €40, including VAT, in Europe. I have inquired on the Affinity support board about the absolute requirement, for the Windows Public Beta version, that the host machine be operating under an "Aero" theme. Do I gather from your comments that this restriction might be planned for the beta only, to assure that beta test reports are under an "optimal" configuration? Australian customers shouldn't be able to pay in Euros?! The guide price there is 80 Australian Dollars (around 53 Euros at today's exchange rate). If you have any details of someone in Australia having to pay in Euros, and at that price, I'd certainly like to hear about it. I have folk talking me that Affinity costs ~ Euro 77 in Australia. Is this true? Evidently the "Aero theme" issue is not the theme itself but rather that Windows 7, when an Aero theme is in use (and maybe some others), engages a new "indirect" (my term) screen rendering engine, which Aero themes require, and which Affinity draws upon. And in fact, in my Windows 7, it seems as if it may be engaged (even though I don't have an Aero theme in place). So maybe, in Windows 7, Affinity checks to see if an Aero theme is in effect, rather than checking for what it actually needs. I'm still sorting this out via Mark at Affinity, who has been very helpful. All his machines are Windows 10, so . . . I cannot find any reference to a Windows version of Affinity anywhere. All I get is a download link to Mac. If I go to Serif the only photo editing for Windows is Photo Plus. Have you seen your physician about this problem? This is of course regarding the beta version of same. For the gamma version you will need to wait 'til next week. And for upsilon, well . . .
Oh, I suspect so. Yes, there was this fellow I met once in San Francisco that I think said he had forgotten Australia. Bless your well-engineered heart, Dougy. It has finally surfaced on my computer with your well guided link. I'll get Telstra on to repairing the plumbing between here and the US. I am reminded of some bloke who forget his heart in SanFancisco and left it behind. Was it the same bloke? Why yes, I believe so. If you do download the Public Beta version of Affinity Designer for Windows, let me know how you make out with the "Aero theme" requirement issue. Thanks! That looks pretty interesting. I may have to give that a try on some of my wedding photos. I had a major data failure recently and my file had to be sent to Adobe to repair it, which they did, but all of the edits for the wedding I was working on at the time were gone. They say it rarely happens...I just wish it wasn't to me when I was under a deadline. What was wrong with the file? • With Windows Vista, Microsoft introduced the Aero scheme paradigm. • At the same time, they introduced (in order to support the new paradigm) a new rendering engine, mainly involving the Desktop Window Manager, which allows the use of hardware acceleration to render the Windows GUI. This is required for the operation of the Aero schemes. It is (in Windows Vista and Windows 7) not put into play unless an Aero style scheme is in use. In Windows 8 (I think) and 10, this new rendering engine is in use regardless of the type of scheme in use. • Affinity Designer depends on this new rendering engine for its operation. Ergo, in Windows 7, one must have an Aero scheme in use before Affinity Designer will operate (and in fact, one must be in place or Affinity Designer cannot be installed). In the past, I have resisted the use of an Aero scheme in my Windows 7 system for various reasons. However, I have made peace with Aero schemes (especially as I have found out that I can decline some of their overly cute Aero-ness with proper settings). Accordingly, I have been able to install and run the latest version of the public beta edition of Affinity Designer. I will say that while it in fact may be speedy in doing its work, it takes a helluva long time to load! I have not yet tried to do anything with it, and of course it will take a while to learn how it works. I understand that it has a generally Photoshop-like user paradigm, but of course I hardly ever used Photoshop, so that isn't much help. But when I get it to spell "cat", I'll let you know my observations. While Affinity Designer has many of the features and functionalities of Photoshop and other "photo editor" applications, its publisher describes it as a "vector illustration and editing program". The sister photo editing program is Affinity Photo (duh!). Like Affinity Designer, it is currently only available for Mac platforms. A public beta of Affinity Photo for Windows is expected to emerge later this year. My apologies for getting myself, and maybe you as well, confused about this. Yes, I know it is now "later this year". But not that much later, evidently. The important advance, my friend, is that Affinity, in both forms offers viable alternative in photo editing, likely based on fresh code by one team. This bodes well for photographers and will stimulate further advances. A public beta version of Affinity Photo for Windows is now available from Serif. As is the case with Affinity Designer, under Windows 7 one must have in effect an "Aero" theme for Affinity Photo to run. The reason, as I discussed earlier, is that Windows 7 uses an advanced rendering engine but only when an Aero theme is in effect. Affinity Photo depends on and requires that rendering engine. As I understand it, under Windows 8 or 10 that advanced rendering engine is always in effect, regardless of the theme type in effect (and I think that in those two Windows versions there are not Aero themes). I have acquired and installed this pubic beta version of Affinity Photo, but owing to pressure of other concerns here I have not had chance to do any editing work with it. When I do get to try it out, I will report my observations here. Looking forward to your experience with Affinity! This software is not merely competent and fast, it allows more folk to do creative "photoshopping" without facing the economic strain of monthly payments that never stop! I like both the competition in the marketplace as well as the democratization of advanced image preparation. I encourage everyone to get their copy and take advantage of this wonderful advance! Affinity Photo for Windows has been released. The introductory price (until 2016.12.22) is $39.99. Purchase during this period brings a free pack of macros (called in Photoshop, "actions"; I always call them "macros"). I would also add to this alternative to Photoshop, (which I am addicted too), the ON1 photo editing suite. They also have RAW development capability that's sophisticated and great tutorials to make your transition painless. But I believe that Affinity is equally brilliant and we are fortunate to have choices!